Everyone seems to have the Magnitone cleansing brush, and now so do I and I don't feel like I'm missing out anymore! In truth I only got mine because it was on offer on QVC, on their easy pay so it broke down the cost for me. Why use a cleansing brush? Because it gives a deep clean where we can't with a face cloth or flannel. I mean, I cleanse every night and think I do a pretty good job, but even at my age I'm still getting a few breakouts (damn you zits!) so thought ramping up the cleansing might help. The Magnitone cleansing brush is a daily cleansing brush with new vibra-sonic technology. With a combination of sonic oscillations & electromagnetic vibrations it gives your skin a workout as well as digging out all the dirt and impurities that we can sometimes leave behind with our regular cleansing routine. In just one minute (with built in timer) your skin gets a deeper clean and it kind of feels nice and polished, but don't worry it's not harsh or anything. I was surprised by how gentle it is on the skin, its just glides, no dragging or irritation at all. I had a similar kind of cleansing brush when I was a teenager and that was harsh I can tell you, it left my skin so red, things have certainly moved on. It has a 20 second beep system so you know when to move on to another area of the face and after the one minute cleanse you have the option of pressing again to use the pulse lift toning mode for another minute. How effective that is, I don't know, I don't always bother with toning mode to be honest. Yep, so you can pop your cleanser on, jump in the shower and brush away killing two birds with one stone! Magnitone say that with using their cleansing brush your products are absorbed by the skin much better. Let's face it, using this daily you'll be cleansing properly and ridding your face of the dead skin build up, so yes your serums and moisturisers are going to sink in better. I was all excited when I first got this brush and then thought that I might get bored with the extra step in my routine and not bother with it. That hasn't happened yet and I think that's because it is so easy to use. The brush head just twists off, you run it under the tap to clean and leave out to air dry. Simples. It comes with a USB charger and the charge lasts forever, well not literally, but it will last a couple of weeks so ideal to take away on your holidays. Magnitone say you'll see results after the first use, and I think I did. I say 'think' because around the same time I added a retinol cream into my skincare routine and my skin became incredibly soft. Retinol or my new brush, I'm not 100% sure, I'm swaying towards it being the brush but whatever, the brush is a permanent step now in my routine because I know it's doing a better cleanse than I can by hand with my muslin cloth. Just to say I double cleanse every evening so I start with a cleanser to take off my make up then I'll cleanse again using the brush leaving me with squeaky clean skin ready to apply my other lotions and potions! 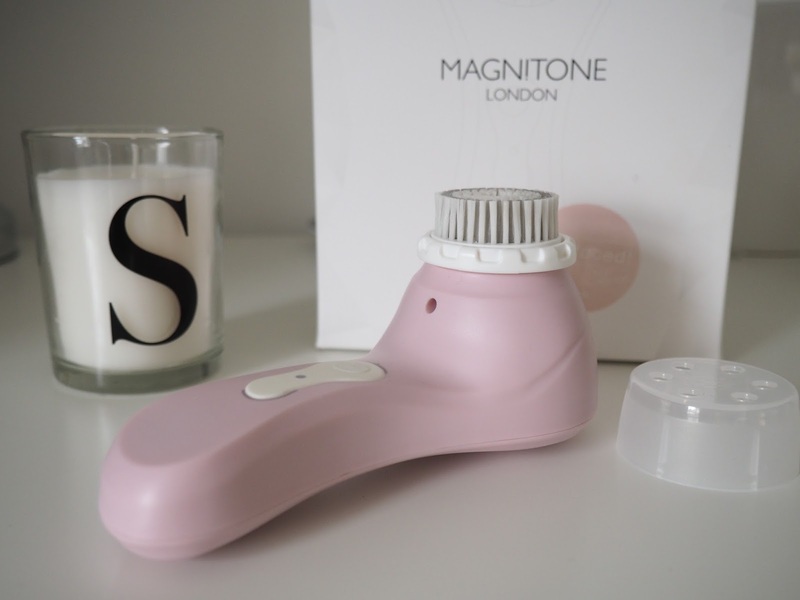 There are other cleansing brushes out there, with Clarisonic being the well known one, however Magnitone are giving them a real run for their money and are right up there with their technology, and more importantly the price point is a lot better on the purse! I've read some great reviews and I'm pleased I made my little investment. You can find out more on the Magnitone website here or head to QVC here as although it's not available on easy-pay now they still have it at an amazing price! Do you use a cleansing brush? Has it made a real difference to your skin? March best buys and one not so!